Craftsman is the brand name for a line of tools sold by Sears, including power drills. A power drill has a chuck on the front which adjusts with a chuck key to hold drill bits of varying sizes. 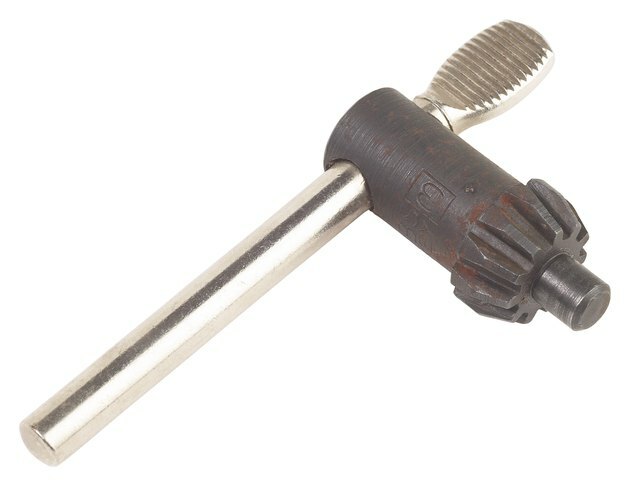 The round key has serrated teeth like a gear. The key fits into the key lock on the side of the drill chuck. It turns clockwise to close when a drill bit is inserted in the chuck and counterclockwise to loosen. if you lose the key, replacements are available at Sears or hardware stores, but first you'll need to determine the correct size to buy. Drill chuck key showing serrated gear teeth at right. Turn the drill on its side to locate the chuck key hole on the side of the chuck. The key hole has a star-burst shape to accommodate the gear teeth on the key. Measure the diameter at the widest point with a ruler to determine the correct chuck key size. For example, common sizes include 5/16-inch, 9/32-inch, 3/8-inch and 1/4-inch chucks. Take the Craftsman drill with you to a hardware store or Sears to test-fit the key replacement before you buy. Many chuck keys for Craftsman drills, including keys sold at Sears, are packaged in a way that lets you test the key fit on the drill chuck in the store before you purchase the replacement. The key teeth should fit securely within the chuck key hole. The correct size key will rotate smoothly without skipping in the hole.